During the time Joan enjoyed her first art teaching post as a 20 year old at Brandwag High, Uitenhage, she painted still lives in mixed media. At that time she was also commissioned for a number of calligraphy projects on parchment for a NG Church. 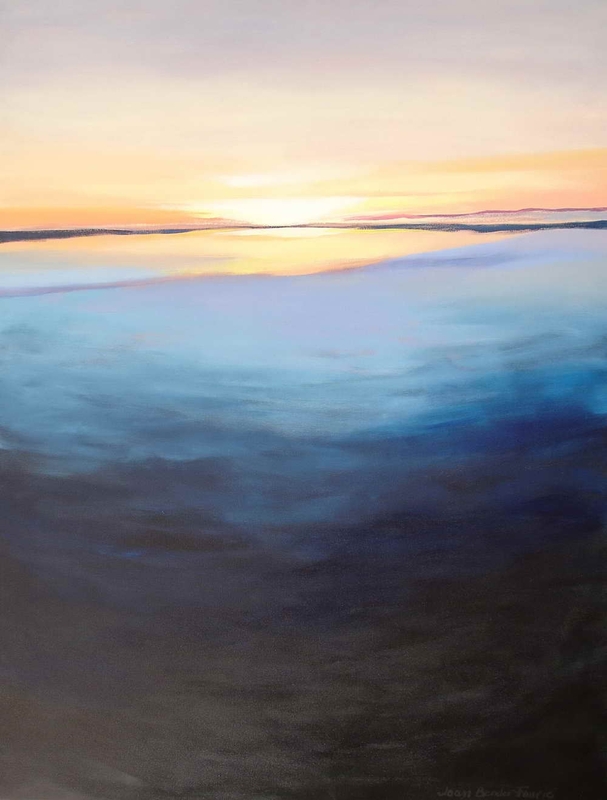 A year later, she devoted herself to expressionistic oil paintings, mother and child studies and impressions of the sea and beaches. Still-life studies of transparent glass objects were also a favourite. She used the palette knife for still life paintings and landscapes. Free brushwork was however, then her prevailing technique. She calls this period her ‘sturm und drang’ period of her youth. Most of the paintings done during the 2nd phase of this period were monochrome or had a restricted colour palette. This tendency remained a characteristic of her art. When she viewed seagulls on a sand dune, she hastily painted them from memory once she arrived home. 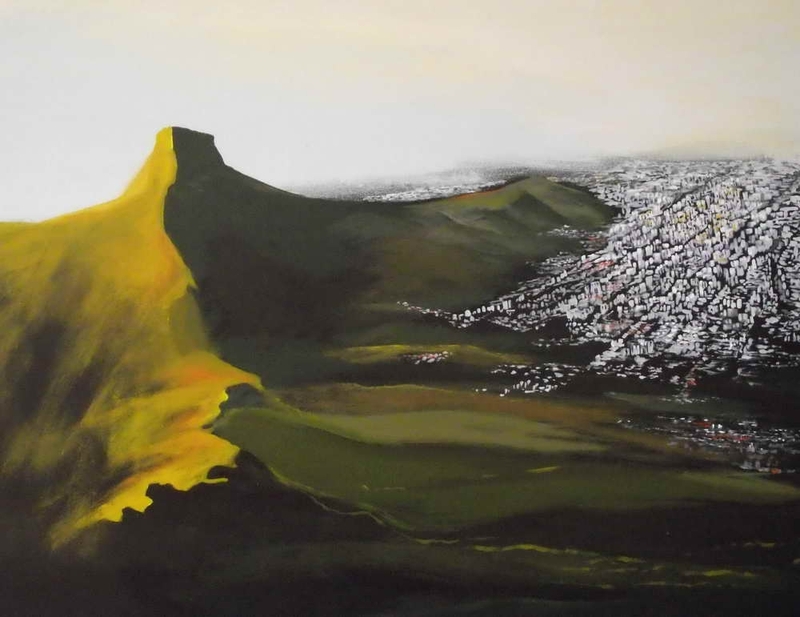 Joan established her own successful private art school in Port Elizabeth in 1965. Besides her graduate studies, she enrolled for additional fine art courses at UNISA for non-degree purposes for interest sake. Many of her drawings were exhibited at the annual UNISA student exhibitions. She reports that she felt free doing the drawing assignments, but found the painting projects very restricting. In addition to these projects she painted mathematic-kinetic paintings and ink spatter paintings for pleasure. These were well-planned but obviously not as free as her later paintings. Freedom of expression became a characteristic of her work. Joan painted a number of large still life and figure studies in oil. She was also responsible for a forest decor scene with side panels in Port Elizabeth. For inspiration she listened to Grieg. She was also responsible for the painting of decor projects for two musicals (Man of La Mancha and Oliver) in East London. By now a number of her paintings were bought for private and public collections in this country and overseas. The family moved to East London during 1979 but returned to Port Elizabeth at the end of 1981. Back in Port-Elizabeth Joan’s painting technique changed drastically. Thin layers were now painted on very large format. The mood of air, sea and plant forms progressively became her inspiration. She maintains that their ‘glass house’ on a cliff, next to a nature reserve in East London, was the origin of the new found freedom. With a view of river and sea, she says that ‘one was always aware of the mood of nature- the colours and the luxuriant plant growth’. Another change was the fact that she no longer painted with oils, but with acrylics. This medium remained her favourite ever since. ‘It is a very intolerant medium. It is not as pliable as oils and dries quickly. This could be both - an asset or a nuisance. But it suits my temperament perfectly.’ Since then she has painted with both enormous and fine brushes. She has never attempted still life painting again. She maintains that it began to bore her. During 1984 Joan was commissioned to do a 3 meter high batik for the foyer of the Dutch Reformed Church, Grasvoëlkop, Port Elizabeth. The batik is back lit. For inspiration Joan chose – GOD IS THE LIGHT OF THE WORLD. Although the family has left East London and living in Port Elizabeth, it is only in 1985 that Homage to Hillcrest is painted. It is a very large painting which is divided into blocked areas. Although it is suggested that the plants are green, peach is the preponderating colour. 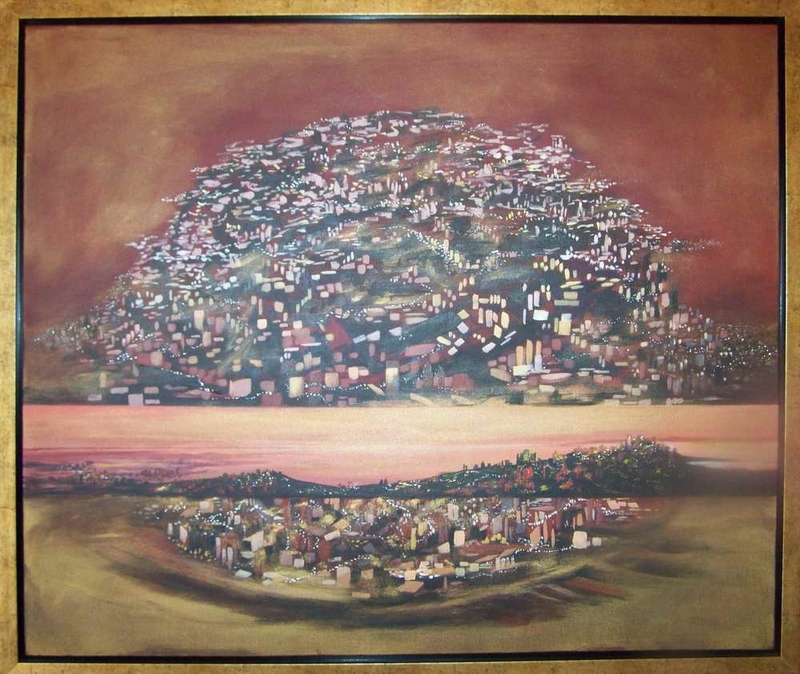 A number of Joan’s large paintings was exhibited at the Port Elizabeth Technikon (now named Nelson Mandela Metropolitan University), and the King George VI Art Museum (now PE Metropolitan Art Museum). 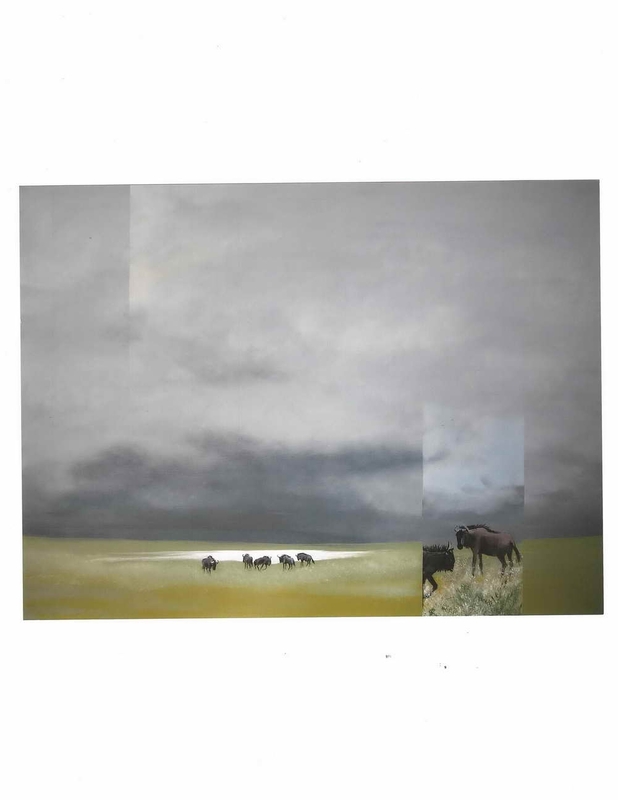 One such painting, ‘Na waters waar rus is’ was acclaimed by the public when exhibited at the Development Bank, Midrand. 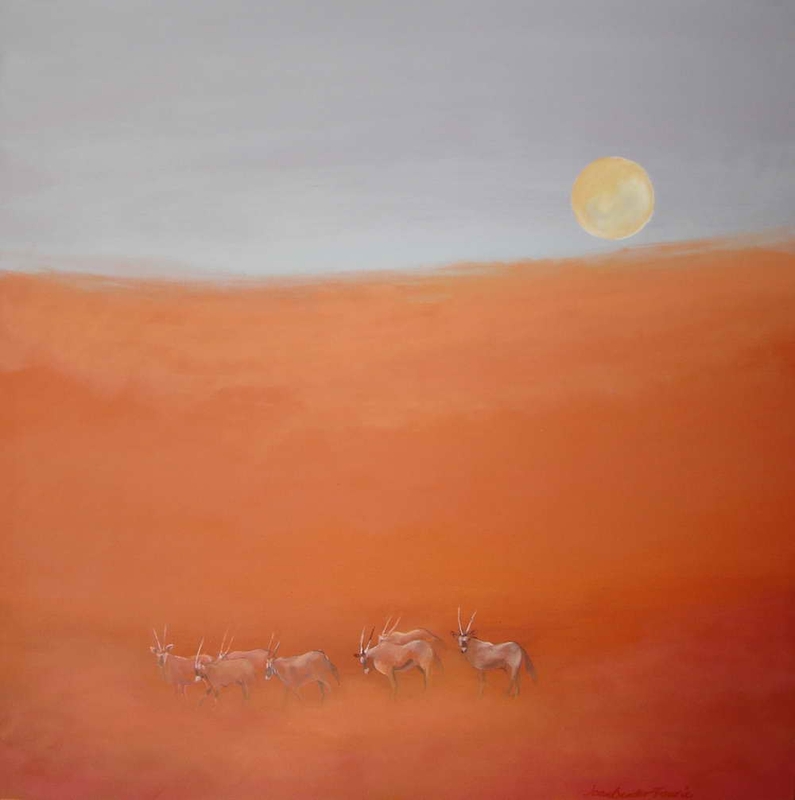 This work is also included in the publication of A Selection of Eastern Cape Art by Helena Theron. This deep-sea scene was painted with large brushes and with thin paint. And light touch. Hues of blue, green and purple are juxtaposed to suggest the rhythm of the waves. Being a city-dweller, who has spent most of her life at the coast it is obvious that the city would feature in her art work. It is, however, often a city at a distance. 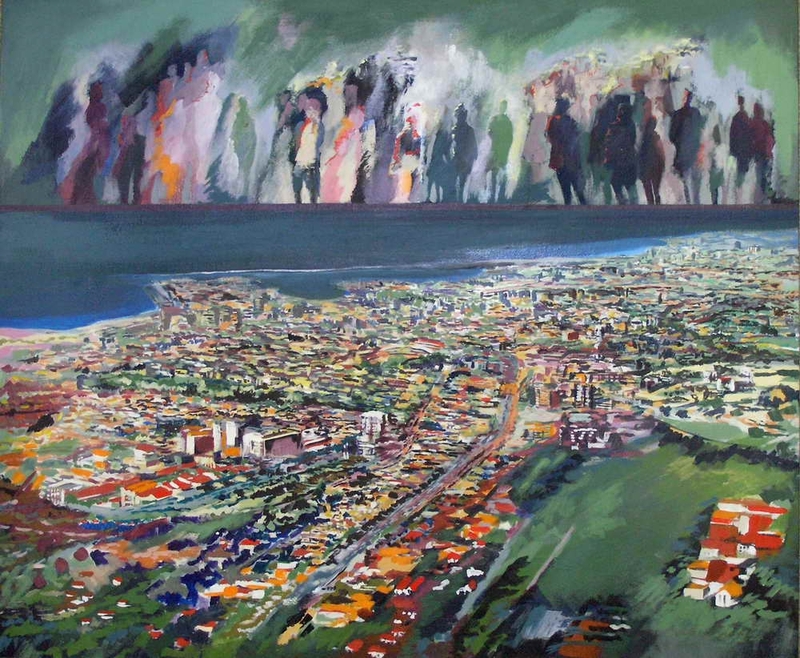 One of the first of many city scenes is now in the permanent collection of the Nelson Mandela Metropolitan University. 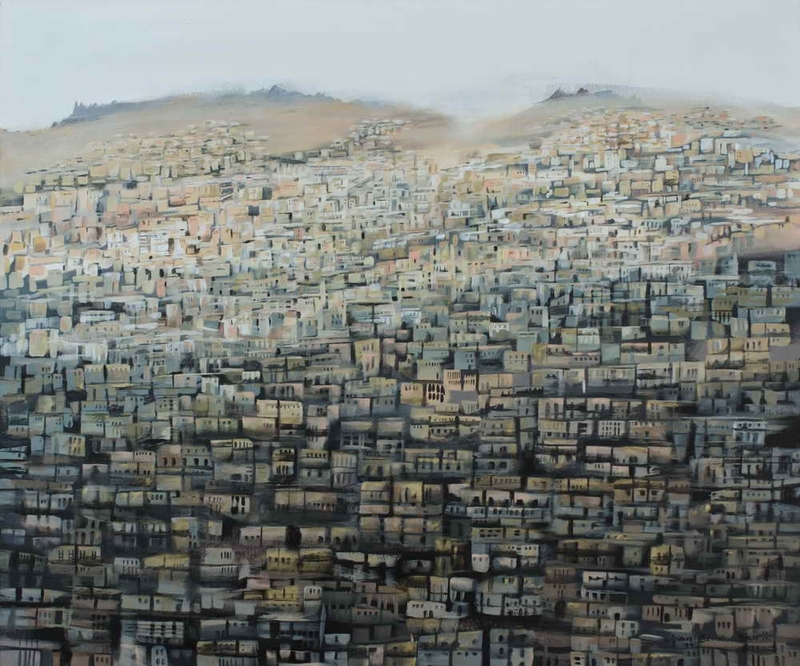 The title of this large work is City/Stad, with a subtitle - you will never know how this moment in time affects the lives of those you will never meet. This idea implicitly remains in the mind in all her city paintings that followed. A portrait of a bridal couple titled 1927 in muted sepia colours was well received by critics when it was exhibited at the Johannes Stegmann gallery of the University of the Free State. Joan contrasts both colour and technique with the soft bridal veil, material en hard floor surfaces. Now and again she painted an abstract during this time. She also executed a number of sculptures. Her Perspex, bronze and fibreglass sculptures were exhibited at various centres in Port Elizabeth. Figure studies, in which detail was reduced to the minimum, appeared at exhibitions, such as Girl with blue eyes. The colours of this work reminds one of the muted colours of 1927 but the touch is lighter. One critic maintained that the former lacked structure due to its looseness. Others, however, reacted positively to this large painting. She received a number of complimentary responses in writing for this work. With their move to Pretoria at the end of 1995, Joan became immensely aware of the Highveld thunderstorms. ‘The light is sharper and the brooding storms overwhelming. The sky is pure drama! The sunrise and sunsets are astoundingly colourful. I love the openness of the veld, the mountains and the silhouettes of trees in the distance’ she declares. It is much later, though, that these impressions appeared in her paintings. First was her ‘Thanks for a blessed life’ in the form as a large exhibition during 2006 of the creation as she sees it. She reports that she studied many academic sources and bibles ‘more than 200 times’ in preparation for this exhibition. She was often in tears and in awe as a result of the wonder of the creation. 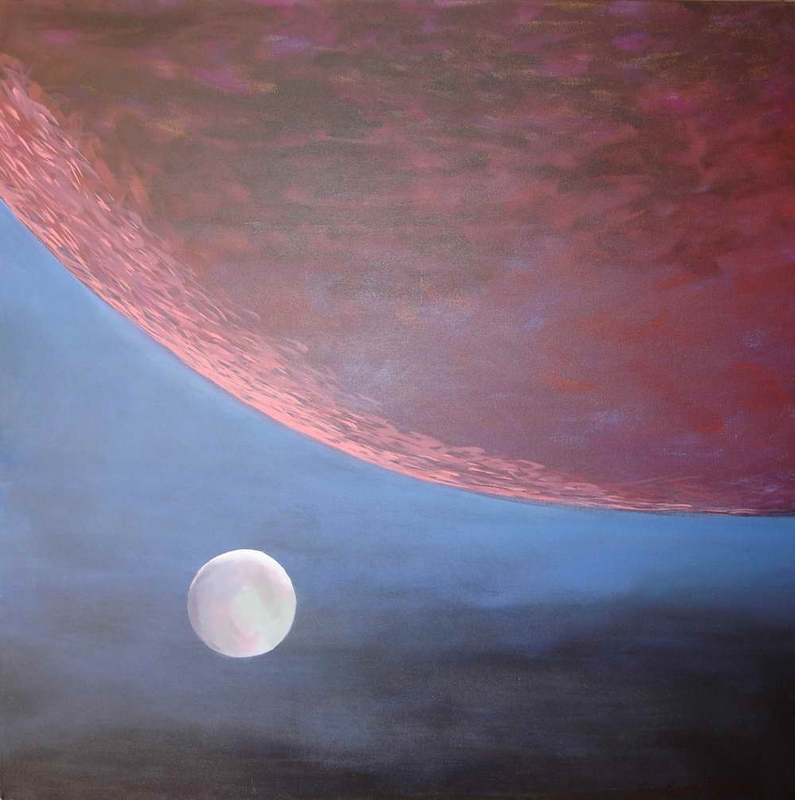 A large and successful exhibition at the Allette Wessels Kunskamer, Pretoria followed in 2006, titled Beginning of All Things. Division of light and dark (1) is a large abstract painting on a black ground with free colourful brush strokes. A number of diptychs and a quadruple panel were exhibited at that exhibition. 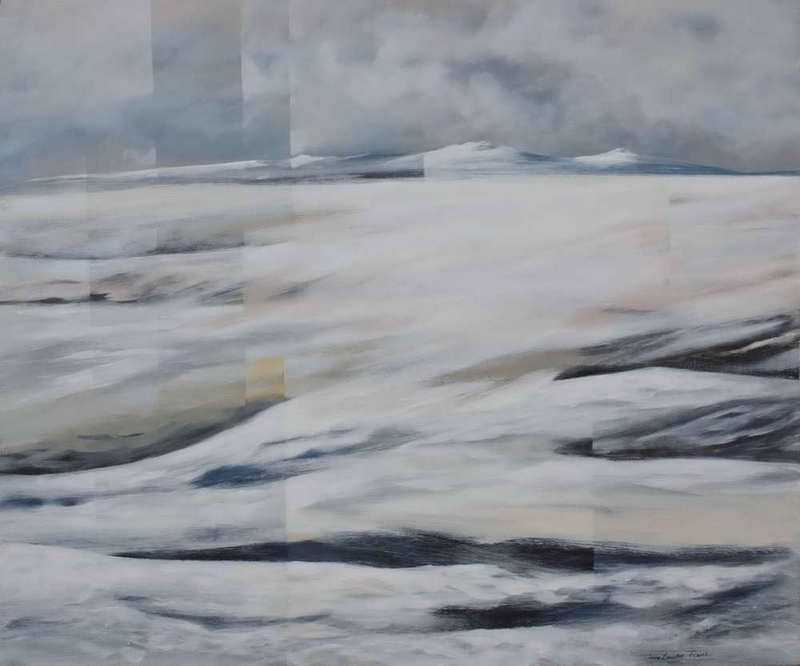 Waters under the Heavens Merge to Reveal Dry Land is a large horizontal diptych. Waves spatter against rocks in the foreground as the waters recede. A number of images on this exhibition is simplified, as in the case of a group of horses galloping in the morning mist. Some are abstract, such as New Beginning. 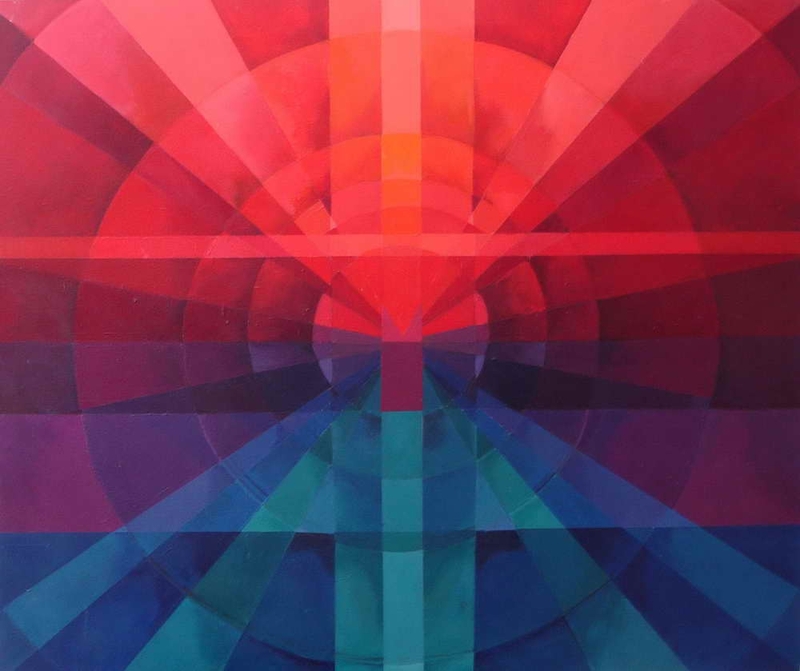 This is a large square format in tones of red, violet and blue and a central cross, accentuates its figurative meaning. The above does not imply that city images have been neglected. On the contrary. As Joan’s duties required regular air travels, images of birds-eye views were etched in her mind. 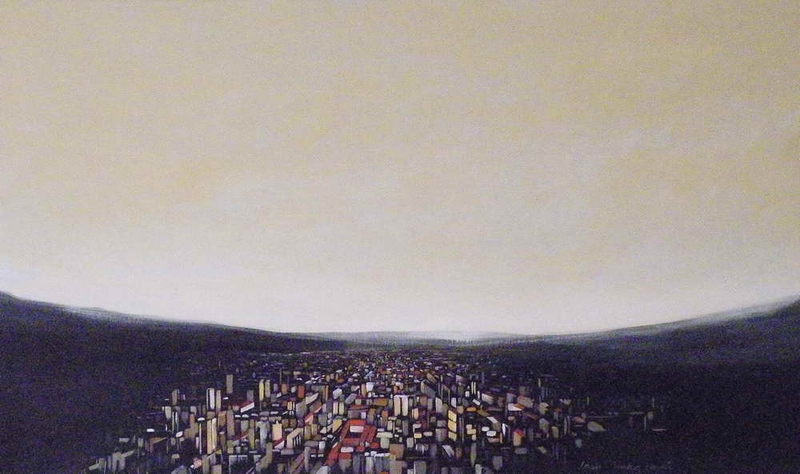 Landing is a large minimalistic portrayal of a city in single perspective and the buildings are reduced to short single brush strokes. Colours are limited: The sky is off-white and mountains, black. Although all is simplified, the impact is strong. A portrait titled Butterfly Child was painted in 2009. The girl seated and in profile, is painted with delicate touch. She wears a wispy blue dress and a ribbon fixes the ponytail. A few frail butterflies appear in the surround. Apparently this painting has a deeper meaning that Joan and the model share. She does, however, provide a glimpse of the meaning in one of her poems. Joan was a prolific painter during this period as she has since retired and could spend more time in her studio. Surrealism was her field of study for both her Honours and MA degrees in art history. Yet, with a few exceptions, surrealism seldom featured in her painting. One of these exceptions is ‘Transition zone - Neither here nor there’. City planners always literally plan a transition zone around a city. But in this painting meaning resides at figurative level. 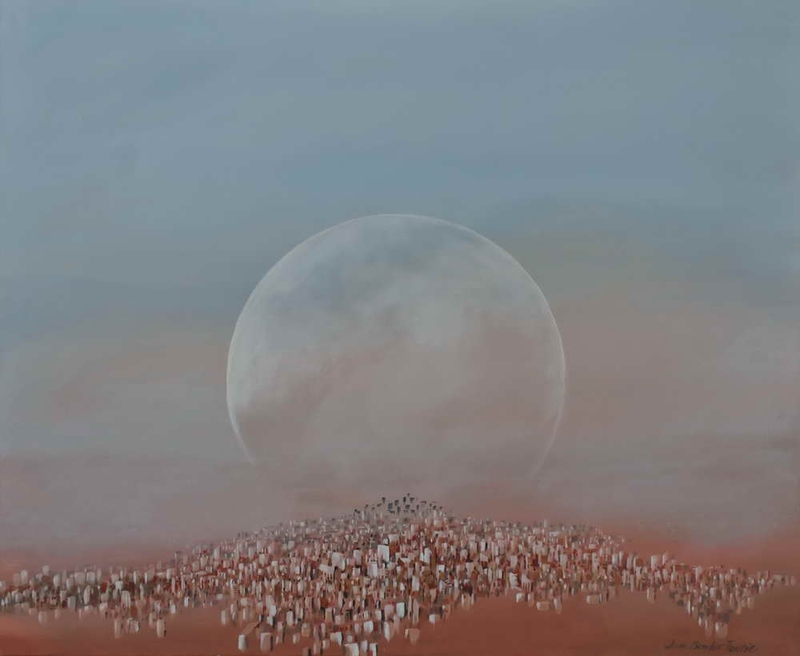 In the foreground a group of people appear in a dualistic white walled area. In a distance there is suggestion of a city. All persons in the foreground have clear facial expressions - yet their moods cannot be determined. Some seems to be happy, others solemn. The title, expressions and dualistic placing of the figures are transferable and so are mood, space, time and place. Another surrealistic painting, completely different in character, is Thorny Issues. 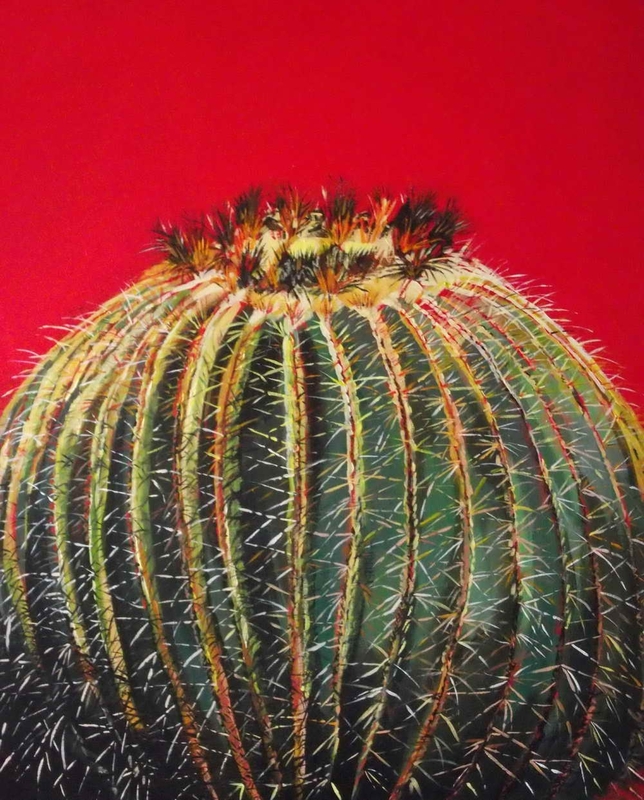 A bold green cactus fills the red format. Joan states that thorny issues are painful. Meaning is thus not at the visible level. This work reminds one of René Magritte’s drawing of a pipe with the title ‘This is not a Pipe’. Many city scenes, in many moods and with numerous viewpoints are painted during this period. The format is still mainly large, but a few smaller ones are attempted. 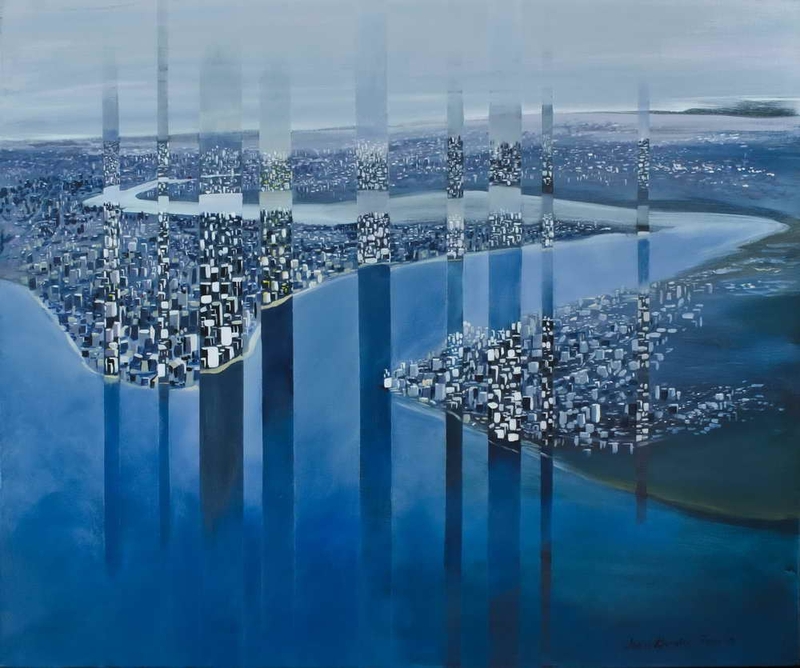 In Fragmented City colour is restricted to tones and hues of blue and white. The coastal city is divided in narrow vertical fragments. Some are zoomed-in sections, while others recede. Yet all buildings remain single brush strokes. Highveld storms, for the first time, appear in Before the Storm. 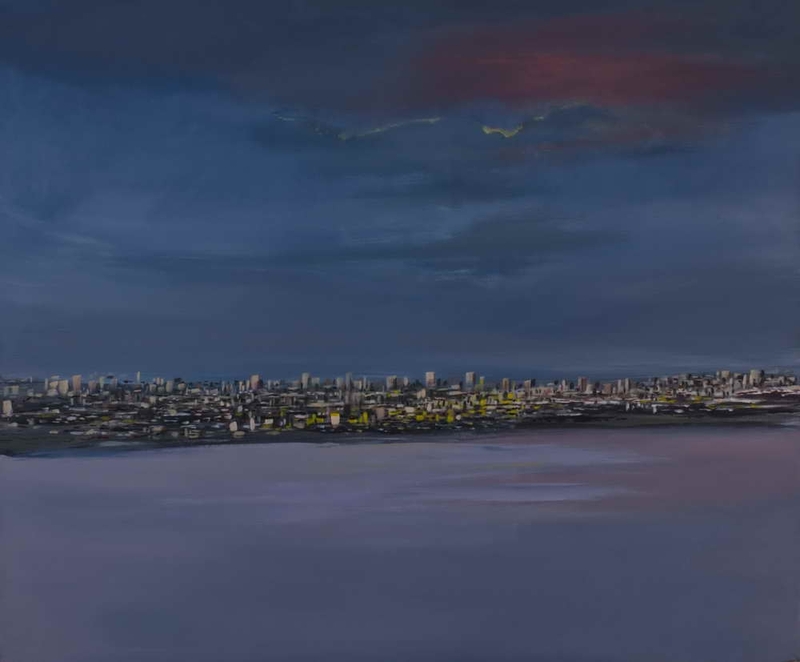 It is not the city at night that evokes the drama, but the contrast between dark converging clouds and the bright yellow fading sunlight in the sky. Brightly lit skyscrapers appear frail and small. Yet this is not a depressing work. Various city scenes like Ancient City and Mountain Shadow are completed. The latter is image and colour related to the former, as buildings are cramped together. Yet, there are differences worth mentioning: Ancient City reminds of a typical ancient city scene on a sunny day. Muted colours are highlighted with a few gold overlay brushstrokes here and there. A fresh artist-mark appears on the horizon. The emphasis in Mountain Shadow is not on the buildings as such, but the shadow in the foreground, ranging from blue to orange. 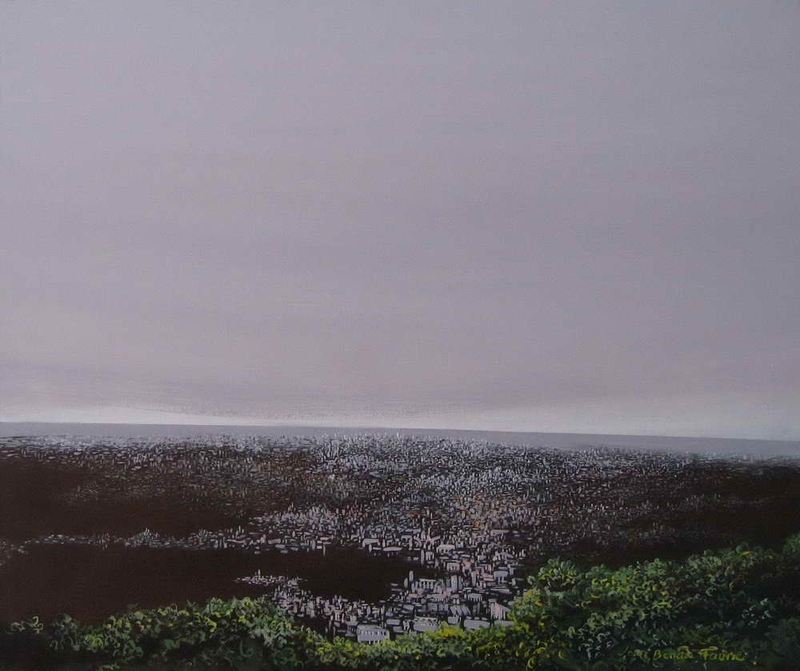 It implies that the viewer views the city from the invisible mountain. The latter casts the shadow on the buildings. 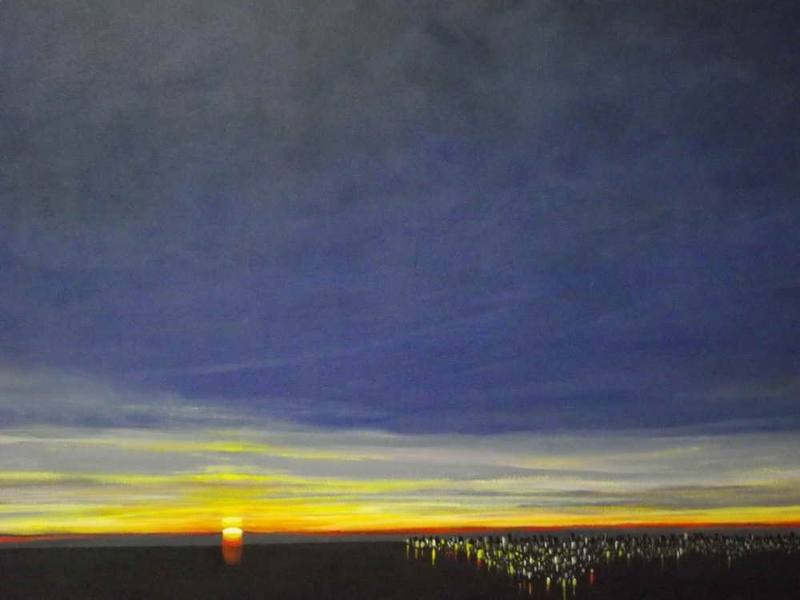 Following a few years of painting city scenes, Joan turned exclusively to landscape painting since 2014. Highveld is a large work of the Highveld planes at dusk. At the horizon groups of minute tree silhouettes are etched against the colourful sunset. Again, it is the moods of nature, the vastness of the sky and clouds that inspire her.